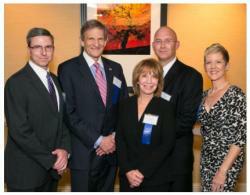 Five outstanding jurists were honored for upholding Colorado’s tradition of fair, impartial and accountable courts before an audience of 700 civic leaders at the Colorado Judicial Institute’s 11th Annual Judicial Excellence for Colorado Dinner October 15 at the Marriott City Center in Denver. CJI honored members of Colorado’s appellate courts, giving Distinguished Judicial Leadership Awards to Chief Justice Michael Bender of the Colorado Supreme Court and to former Chief Judge Janice B. Davidson of the Colorado Court of Appeals. The Institute also honored outstanding performance at the District Judge, County Judge and Magistrate level with its traditional Judicial Excellence Awards. Those awards went to Chief Judge James F. Hartman, Jr., of the 19th Judicial District, Adams County Court Judge Leroy D. Kirby and Magistrate Emily Anderson of the 17th Judicial District. The awards dinner was keynoted by Colorado Gov. John Hickenlooper, who plays a key role in maintaining the merit system of judicial selection adopted by Colorado voters in 1966 by filling judicial vacancies from a list of three nominees screened by non-partisan selection panels. CJI is a non-profit citizens group founded in 1979 which works to maintain that merit selection system while improving the quality and accountability of Colorado’s judiciary. Besides recognizing judicial excellence, the annual dinner helps raise funds to foster that very excellence. Since CJI created its Judicial Education Fund in 2002, it has raised more than $280,000 to support continuing education for judges, magistrates and full-time judicial department employees. Such grants have become even more important in recent years as the state’s fiscal crisis has forced cutbacks in the court system’s budget even while caseloads continued to grow.